Darwin's finches show enormous diversity in beak shape and size that varies with diet. The EU-funded Finch Evo-Devo project has used genomics plus – transcriptomics – to explain how 15 species of finch evolved from a single ancestor which landed on the Galapagos Islands. According to evolutionary developmental genetics, or 'evo-devo', most adult biological shapes can be already seen during embryonic development (i.e. before birth/hatching) as animals are being formed. A classic example is the transient appearance of gills and a tail in humans, only to be lost later on in the process. These developmental genetic programmes vary in different species as a result of differences in regulation of genes active during embryonic development. 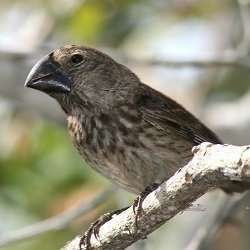 In Darwin's finches, the different beak shapes and sizes are already obvious in the late embryos. This shows that the beak morphology is genetically determined, and doesn't depend on the factors of the environment (like feeding) after hatching. "We studied Darwin's finches from the Galapagos Islands, because they are an iconic example of evolution by natural selection and so much of their survival depends on their beaks," explains Dr. Arkhat Abzhanov, coordinator of the Finch Evo-Devo project. Previous research by the group using mathematical modelling showed that the shapes of beaks can be divided into three groups. Size varies within each group and groups are distinguished by beak curvature. "We previously discovered that during embryonic development of species from group A, the three dimensions of the beak – length, width and depth, and the two tissues that give rise to it – cartilage and bone, are all regulated independently by different signalling pathways," outlines Dr. Mariya Dobreva, the fellow leading the research. The upshot is that the separate developmental modules allow for independent variation among them, therefore increasing overall variation. This may serve to explain the incredible diversity of living things on our planet. Comparative whole transcriptome sequencing is genomics plus – while genomics gives information on the "recipes" for building a body, transcriptomics shows us how these recipes are carried out, revealing details of where and when the developmental genes are active. The team compared mRNA composition in a particular tissue, in this case, the beak primordium when the beak shape is forming. The Finch Evo-Devo team is currently validating a subset of new candidate genes. Gain- and loss-of-function tests with genetically engineered viruses carrying the gene of interest on developing chicken embryos will reveal their roles in beak morphogenesis. "The tests in chicken embryos aim at mimicking the beak shape of different Darwin's finch embryos in chicken. Successful mimicking after manipulation with a particular gene will confirm its role in beak shape morphogenesis," says Dr. Dobreva. Finch Evo-Devo successfully optimised the new protocol for future use and the transcriptome has been sequenced for all three groups of Darwin's finches. Differences in expression between species together with knowledge of gene networks have prompted the start of the elucidation of the complex regulation of beak curvature formation. To date, the team has validated some of the best candidate genes by in situ hybridisation – an assay that helps detect the exact location of gene expression in sections of Darwin's finch embryos. A highly successful field trip to the Galapagos Islands delivered enough embryo samples to finish the project work. Dr. Dobreva has represented the team at international and national conferences, trained students and led a field team. Shortly, she will be working on the publication of the results of the Finch Evo-Devo project. The next steps will be to complete the validation of the genes and networks identified. Follow-up funding is required and unfortunately, lack of funding to date has hampered the progress of the research. Summing up, Dr. Abzhanov concludes, "After publication in a high impact scientific journal, the team will focus on more outreach activities." Finch Evo-Devo research results promise to have significant applications in the field of developmental genetics and not only in finches. The new protocol devised lies at the very heart of developmental genetics and could be the basis of studies in development of other organisms. "As such, funding for basic research is as important as for applied research," notes Dr. Abzhanov.